Our most recent mentorship was offered by Kathryn Portelli. 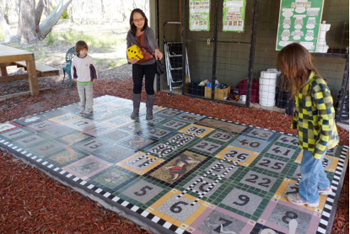 Kathryn was commissioned by Kyneton Bush Resort in Central Victoria to fabricate and install a 2.8 x 4.00 metre mosaic ‘Snakes ‘n’ Ladders’ board game in the grounds of the resort. Kathryn was assisted by mentee, Hanh Truong. The mosaic consists of 66x 400mm squares and is in a beautiful bushland setting. It is made up of 50 numeral squares and includes images of Australian snakes species. Mentee Hanh Truong is pictured here with her children, enjoying the new mosaic.